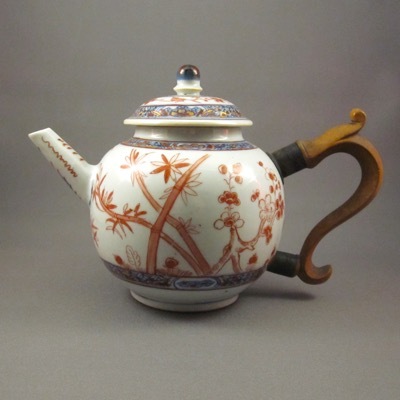 This beautiful porcelain teapot was made in China in the mid-1700s and is decorated with cherry blossoms, bamboo, and birds using cobalt blue underglaze with red and gilt overglaze enamels. 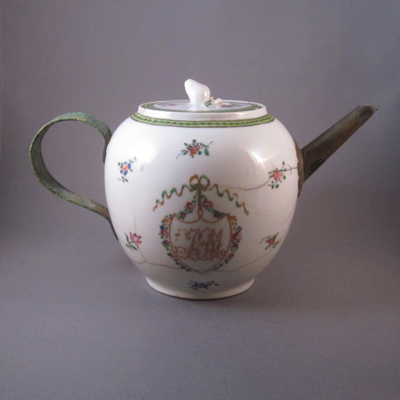 It stands 5 inches high and is 7.25 inches wide from handle to spout. 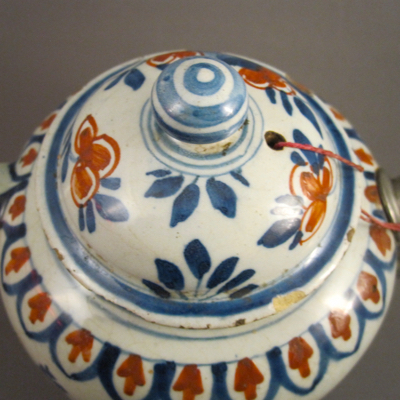 The matching lid has a skep shaped knob. 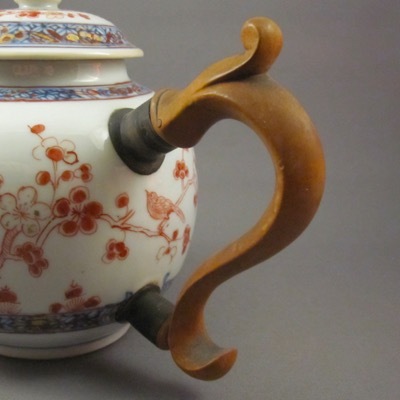 For me, the real beauty of this teapot is in the overscaled wood replacement handle, which would look more at home on a pewter teapot of the same period. 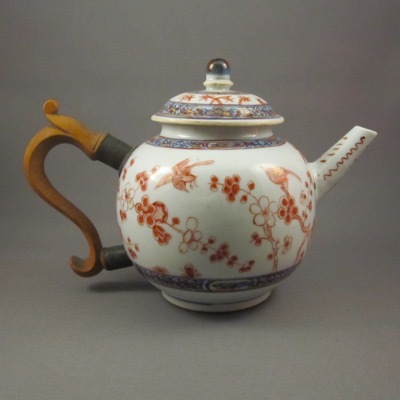 I have many teapots in my collection with similar wood replacement handles all made with an electric log splitter, each with slight variations. 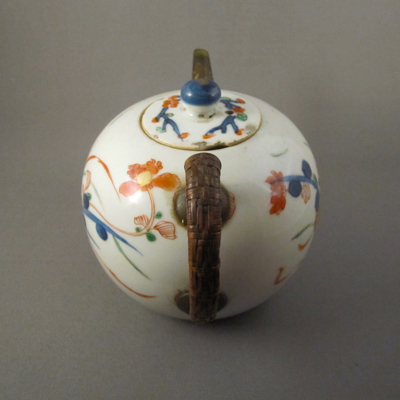 I find the fanciful carved wood handle is in direct contrast to the simple globular form of the body, making for a quirky mashup. 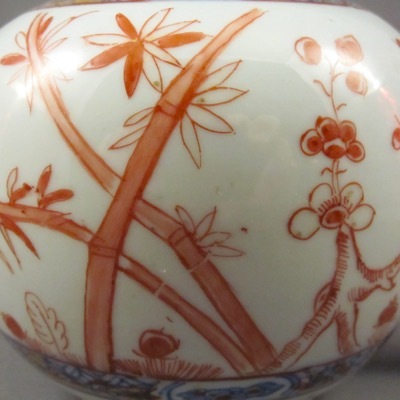 Naturally, I prefer this unique example over a “perfect” one any day. 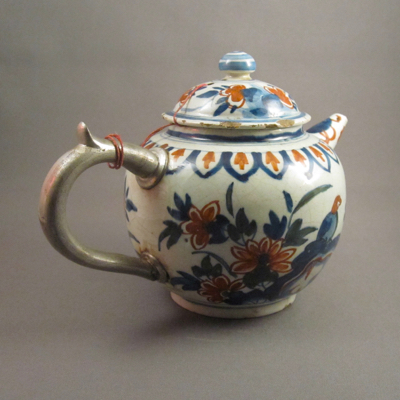 This teapot with similar form shows what the original loop handle on mine might have looked like. 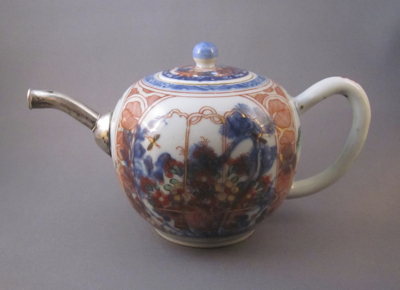 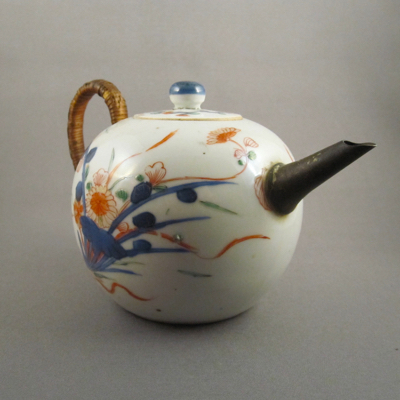 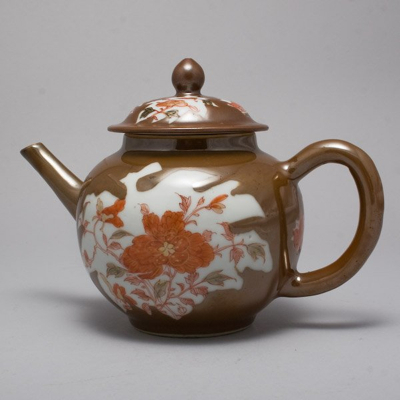 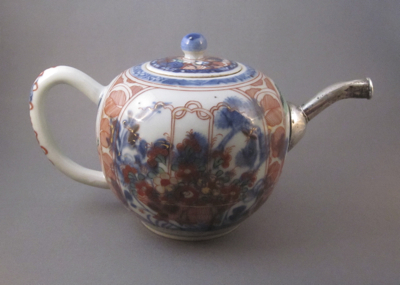 This globular form porcelain teapot was made in China in the mid-1700s for export to Europe and North America. 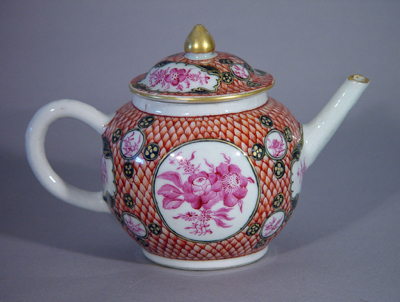 It measures 6 inches high and 9 inches from handle to spout and is decorated in the famille rose palette with a coral scale ground and puce flowers. 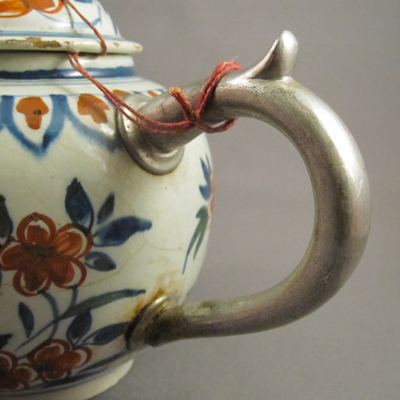 Soon after the teapot dropped and the handle shattered, it was taken to a tinker, jeweler or metalsmith who fashioned this nicely made metal replacement handle. 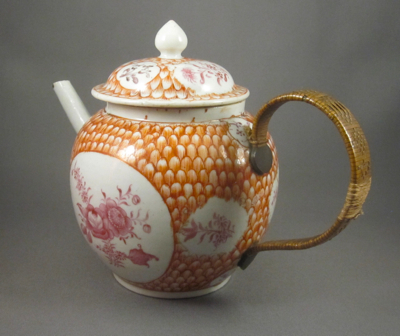 To help insulate delicate hands from the hot contents, the handle was encased in woven rattan. 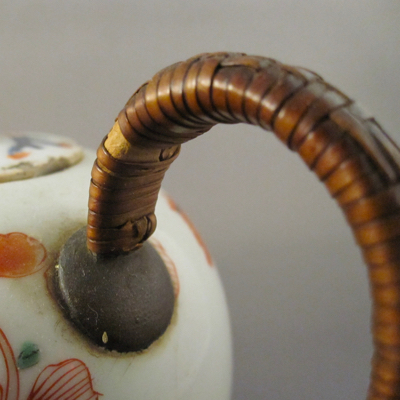 I have dozens of examples of woven rattan handles and have noticed distinctly different patterns among them. 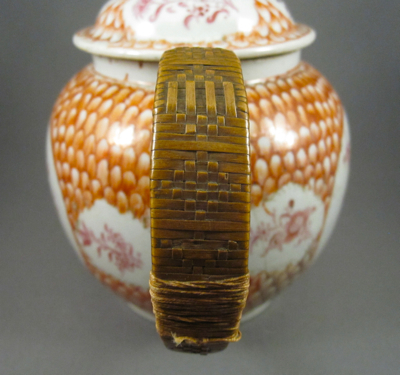 I am hoping to one day match up the woven handle patterns to specific makers, although I know that is a long shot. 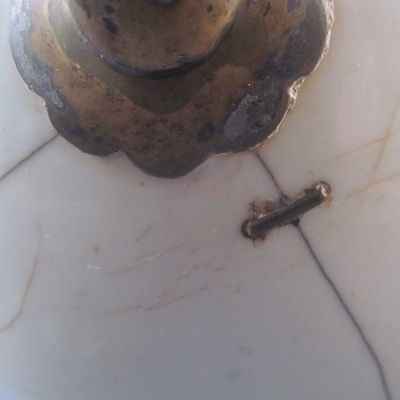 As an added bonus, a small section of missing rattan has been patched using string, no doubt at a later date, a true case of a make-do making-do. 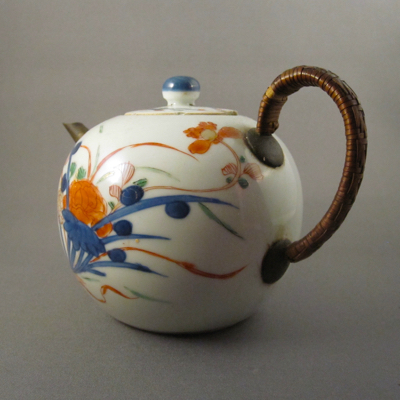 This teapot with similar form and decoration shows what the original loop handle on my teapot looked like before it took a tumble. 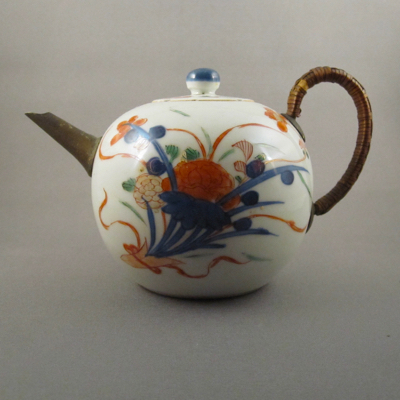 This globular form teapot with hand painted floral decoration in cobalt blue and polychrome enamels was made in China for export to the European market in the mid to late 1700s. 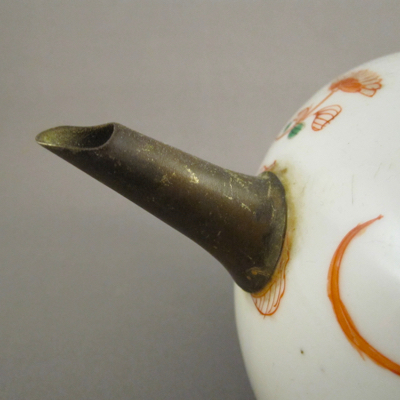 It measures 5-3/4″ high and 8-1/2″ wide from handle to spout. 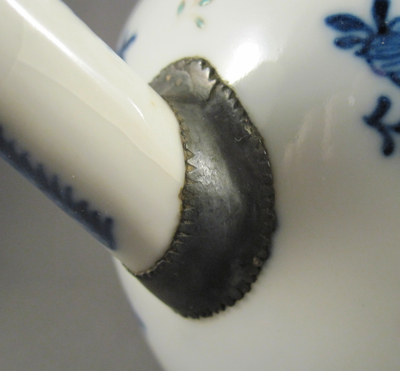 After the teapot was dropped it was taken to a china mender who added an unusual crimped edge pewter sleeve at the base of the spout. 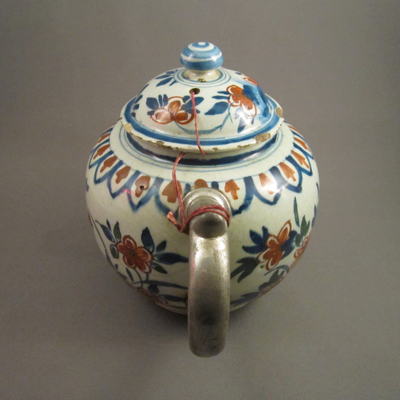 Additionally, a hinge was added to attach the lid to the pot. 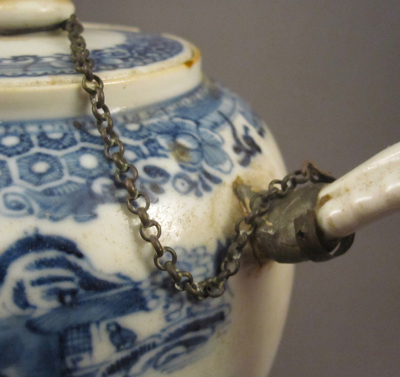 I have many examples in my collection with metal chains added to keep teapots and lids together, but this is the first time I have seen an elaborate hinge of this sort. 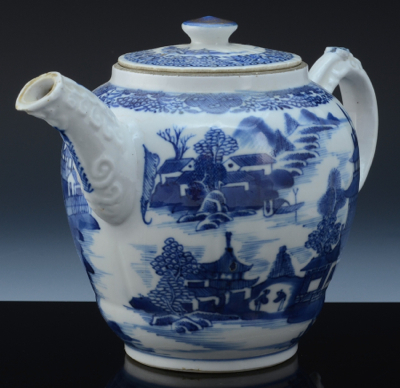 This striking globular form teapot was made in China during the Qianlong period (1736-1795) for export to North America and Europe. 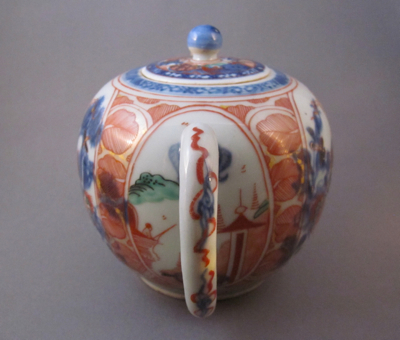 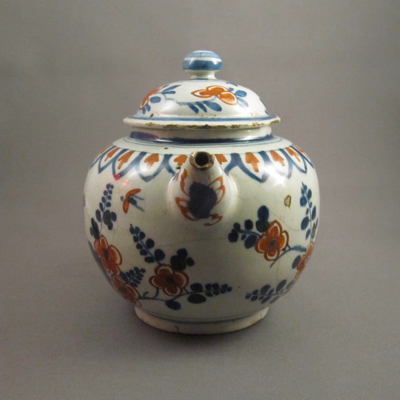 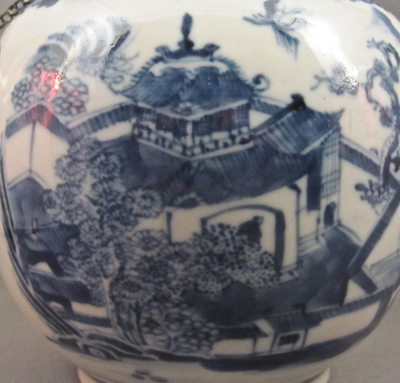 It stands 5-1/4″ high and is decorated in cobalt underglaze with pavilions on islands in a lakeside setting. 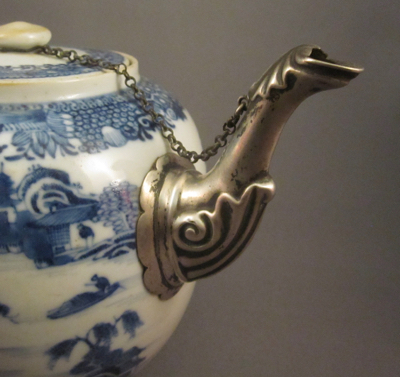 After the original spout became damaged, the teapot was taken to a silversmith sometime in the 19th century, who replaced it with a silver Rococo style spout. 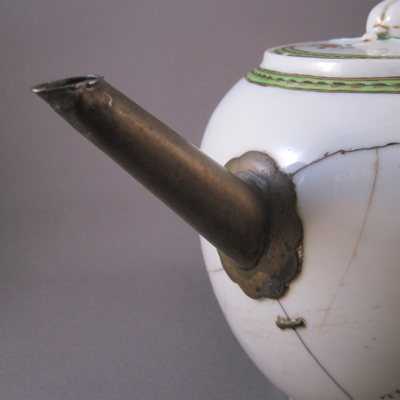 I have seen many other examples of the same silver spout used on repaired teapots from the same period, so I imagine they were mass produced. 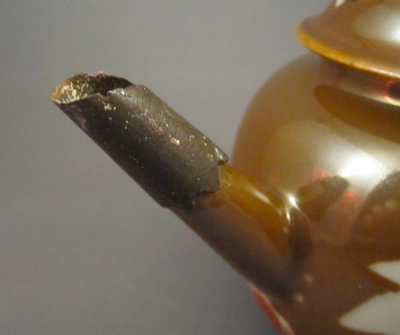 In addition to the replacement spout, the broken handle has been riveted to the body and appears to be a later repair. 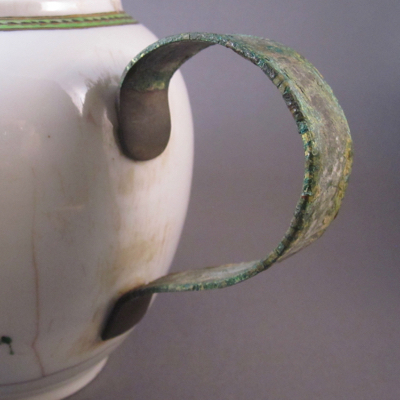 By this point, the owner was taking no chances and chained the lid to the spout and handle to avoid further damage. 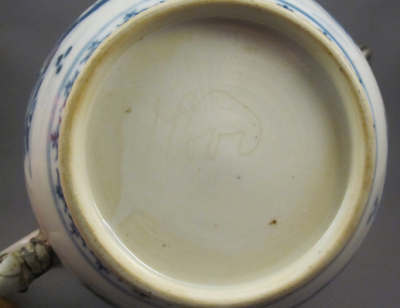 On the underside is an etched signature Hood (? 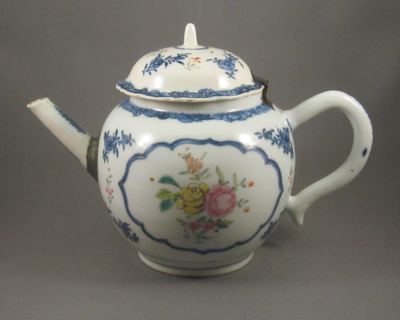 ), but I am not sure if this was the owner of the teapot or the mender. 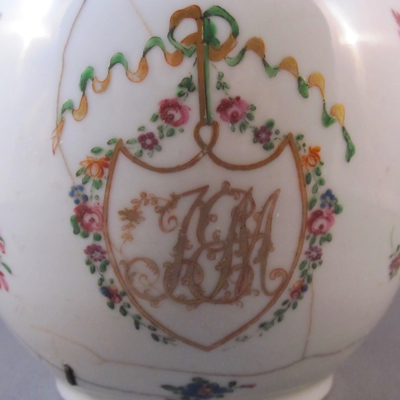 I am hoping that it’s the latter and am on the hunt for more examples of signed ceramics. 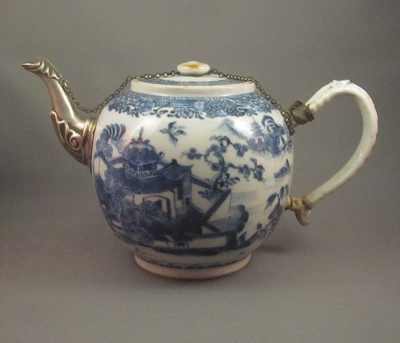 This teapot with similar form and decoration shows what the original spout on my teapot might have looked like. 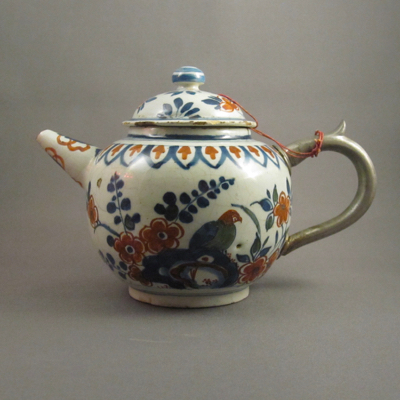 This Qianlong period globular form teapot has a C shaped handle and an inlaid flat lid with round knob. 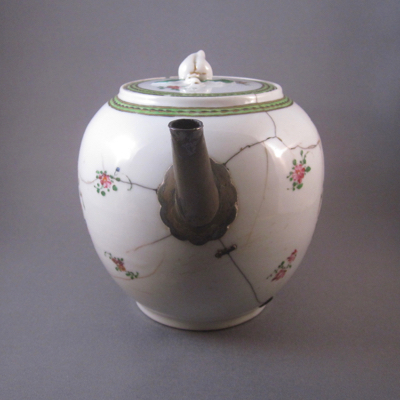 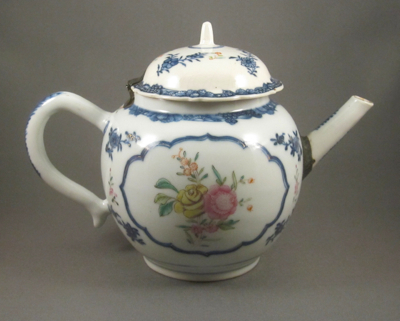 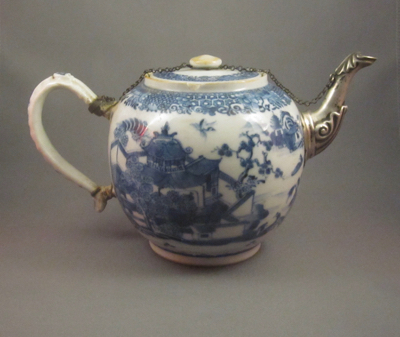 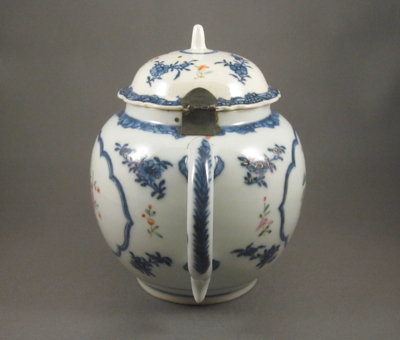 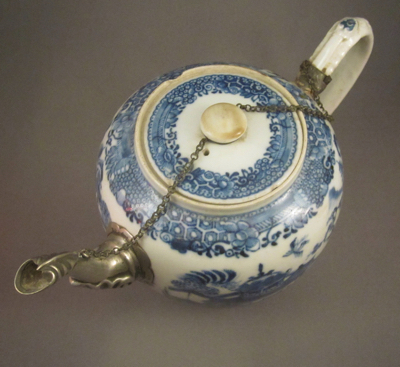 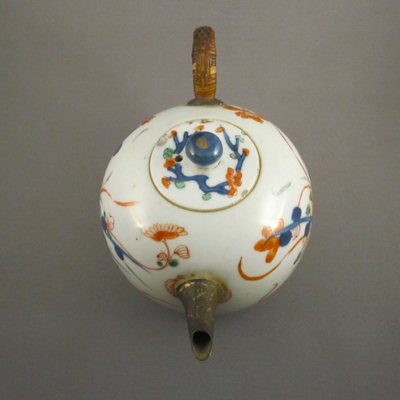 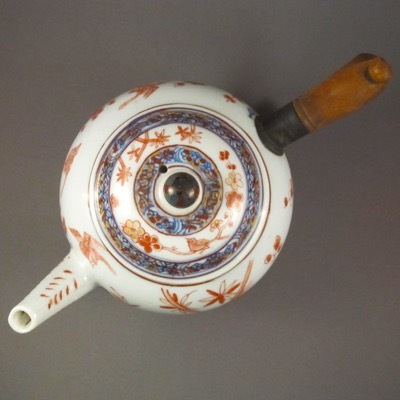 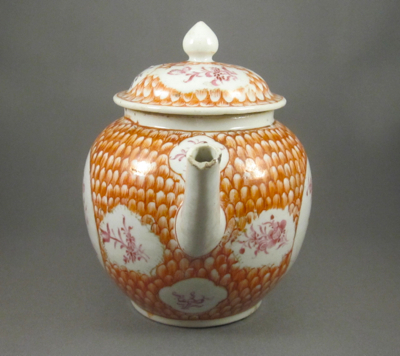 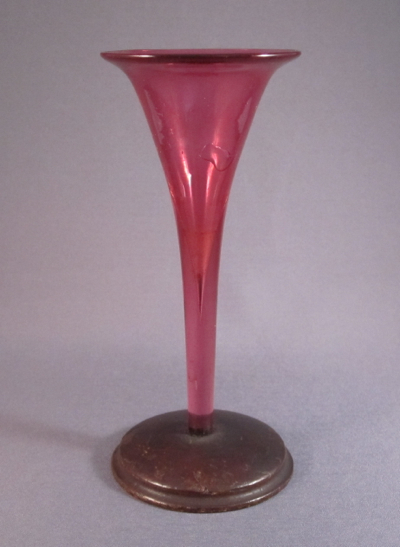 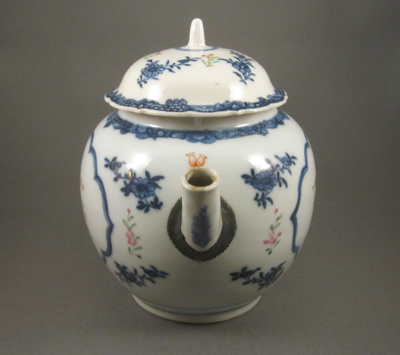 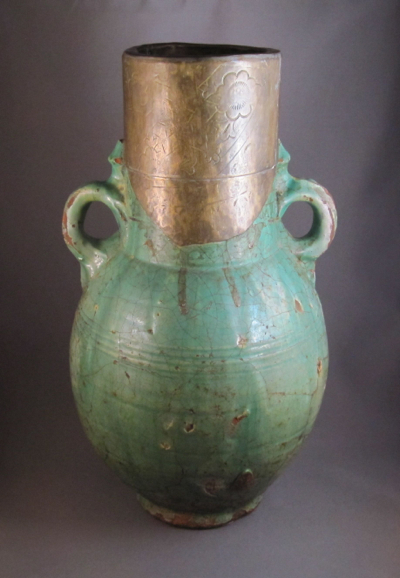 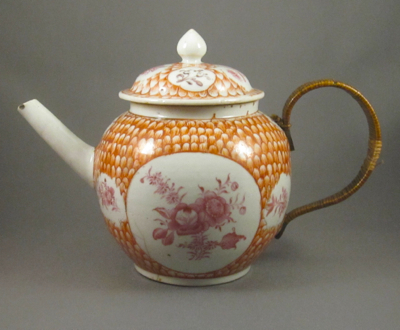 It was made in China in the mid-1700s and stands 4-1/4″ tall and 7-3/4″ from handle to spout. 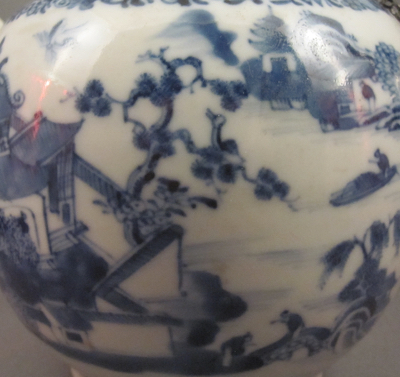 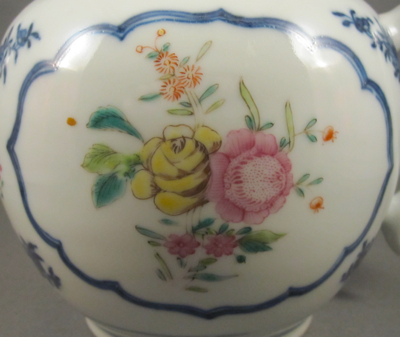 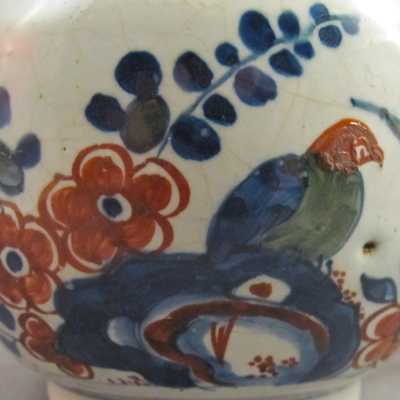 The original blue underglaze decoration fell out of fashion shortly after it was made, as by the mid-1700s more “attractive colors” were the taste of the day. 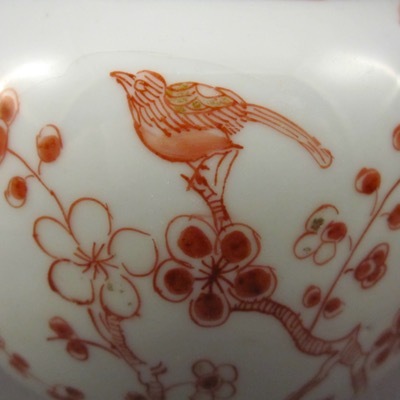 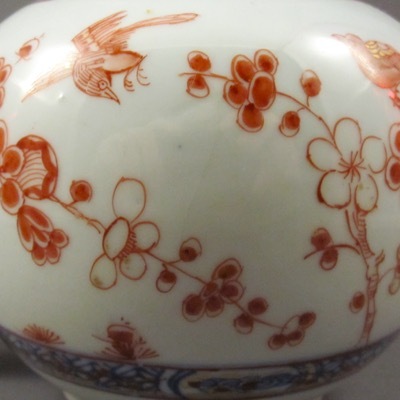 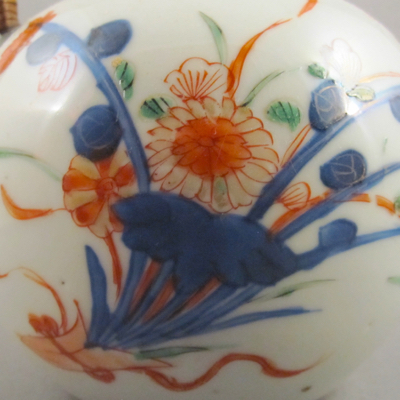 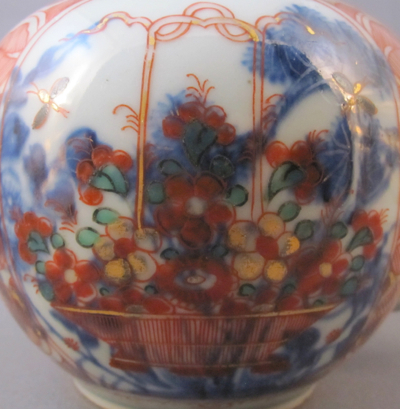 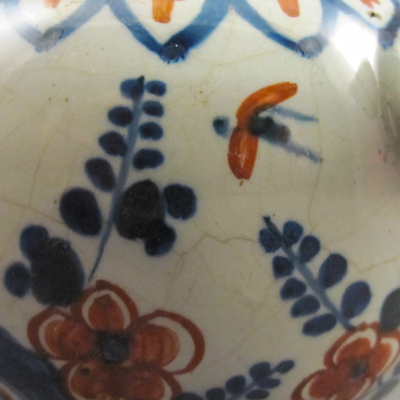 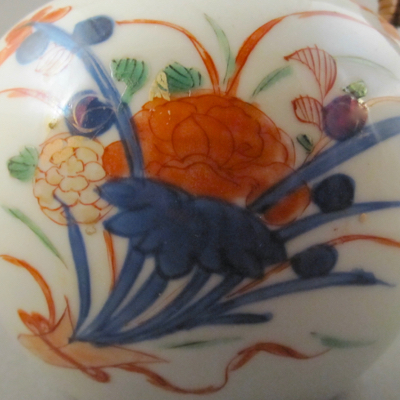 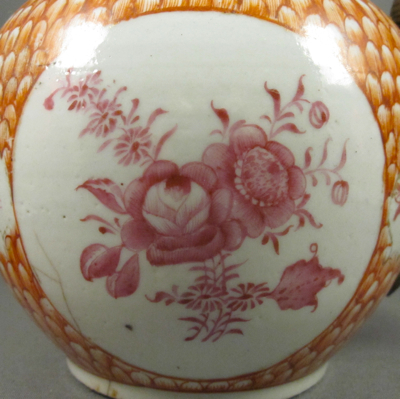 In order to keep up with the sudden demand for polychrome Chinese ceramics, factories in Europe took the unwanted blue and white decorated pieces and overpainted them with brightly colored enamels, often without regard for the original design beneath. 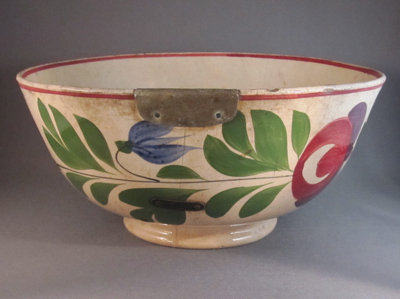 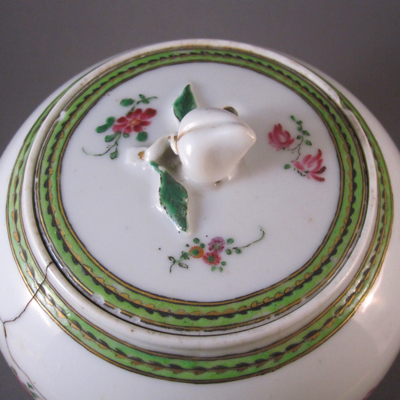 This victim of clobbering, as it is also referred to, or Amsterdam Bont, when done in Holland, has been over decorated with the flower basket motif, one of the most popular designs. 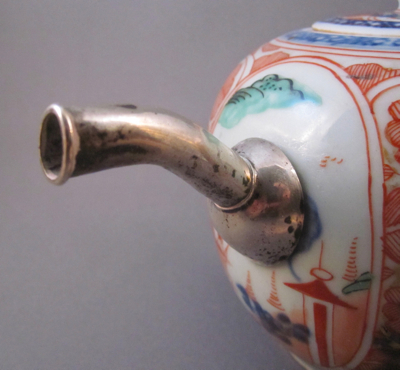 The unusual form replacement silver spout appears to have been made by a skilled 18th century silversmith. 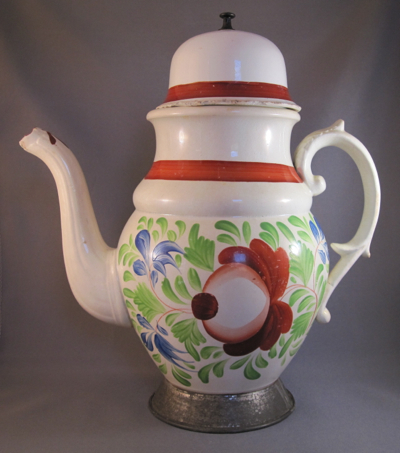 It replaced a straight spout, but I think this replacement is much more interesting, and adds to the quirkiness of this twice-decorated teapot. 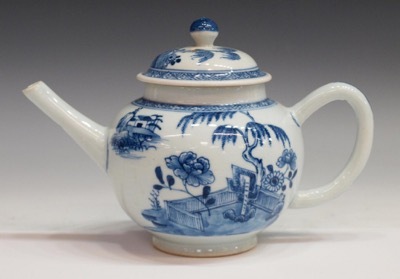 This teapot with similar form and decoration shows what the spout on my teapot might have looked like. 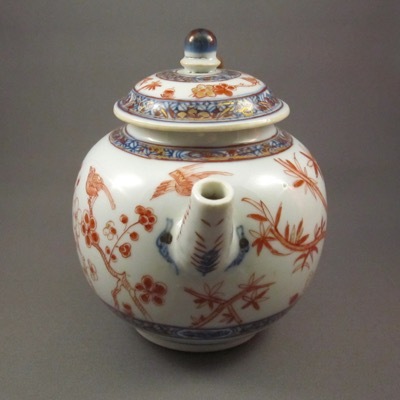 This globular form teapot was made in China during the Qianlong dynasty (1736-1795) for export to Europe and North America. 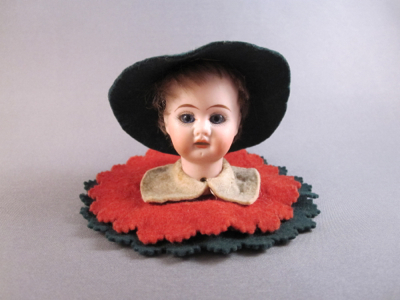 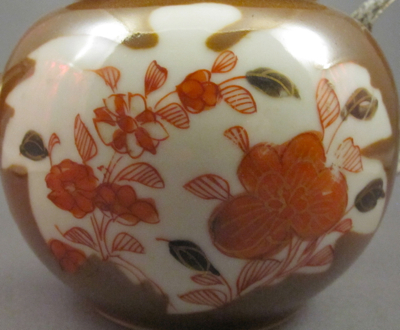 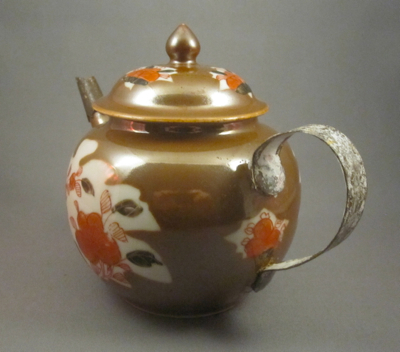 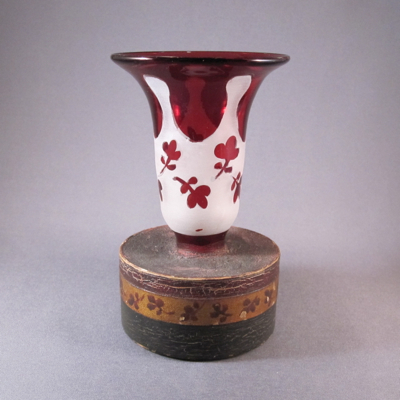 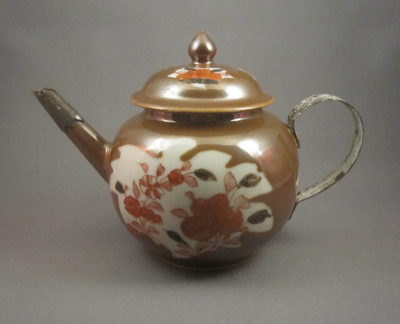 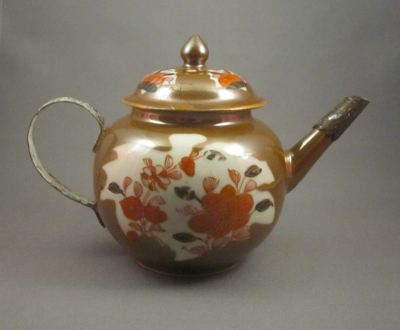 It measures 5″ tall and 7-1/2″ wide from spout to handle and is decorated in the rouge-de-fer palette, with painted flowers in asymmetrical reserves using red, orange, and black enamels with gilt highlights on a chocolate brown ground. 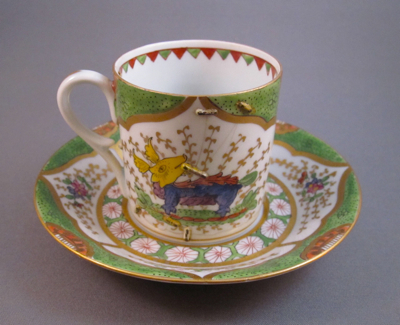 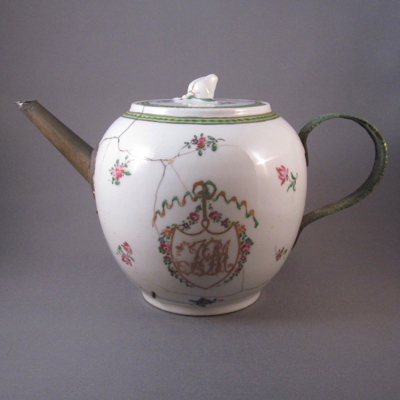 Batavia ware, aka Capuchin ware or Cafe au lait, was highly favored by the Dutch and named for the city of Batavia (today Jakarta, the capital of Indonesia), the center of Dutch trade in the 18th century. 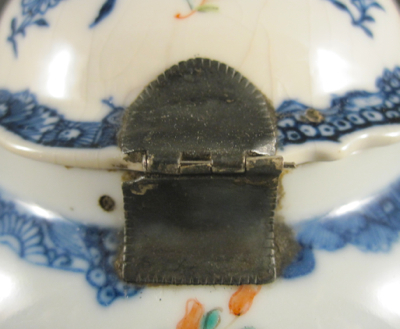 An iron sleeve with sawtooth edge covers the tip of the broken spout, replaced in the 19th century by a local tinker or itinerant china mender. 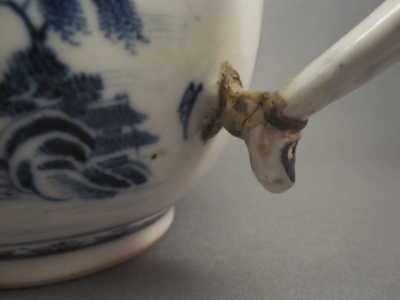 A simple loop iron handle, bearing the remains of white gesso, replaces the broken original. 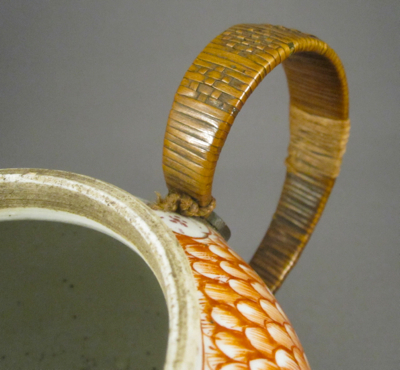 Unlike many similarly replaced metal handles I find wrapped in rattan, this one shows evidence of being an armature, upon which layers of compound were applied then painted to emulate the original form and surface. 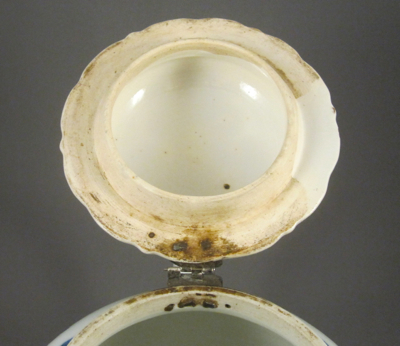 As this type of unstable compound deteriorates over the years, dealers and collectors have been known to chip away at it, exposing the bare metal. 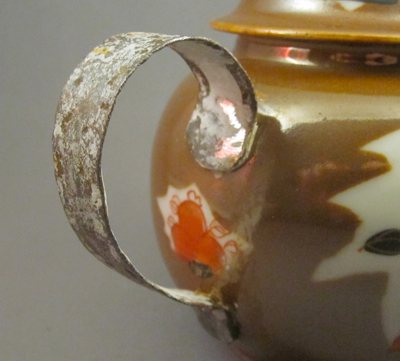 The conservator in my likes an original crusty, compound-laden handle but the collector in me prefers a more esthetically pleasing clean metal surface. 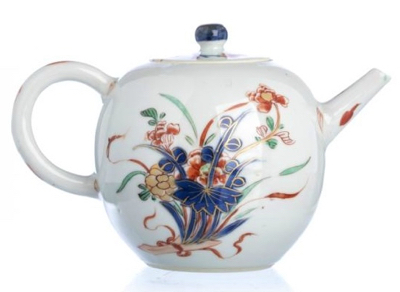 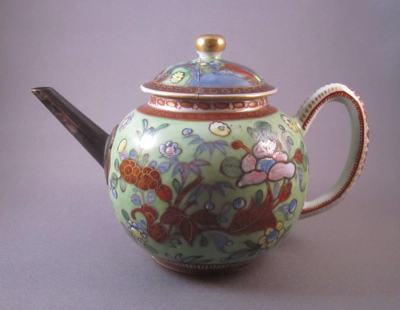 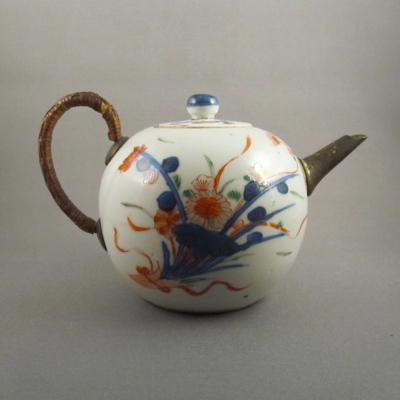 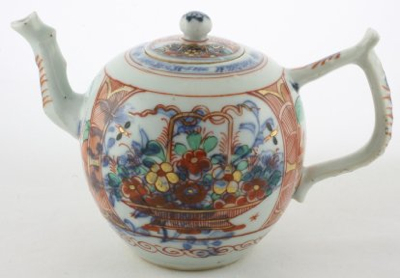 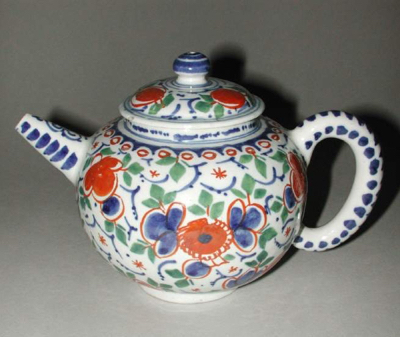 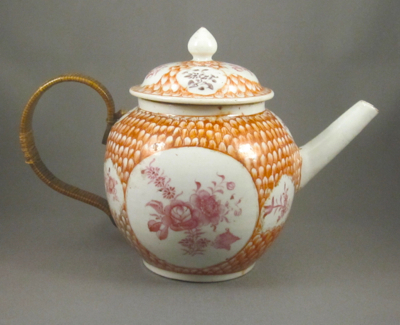 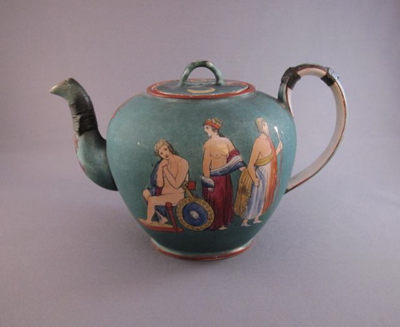 This teapot, with nearly identical form and decoration, still has its original handle and spout. 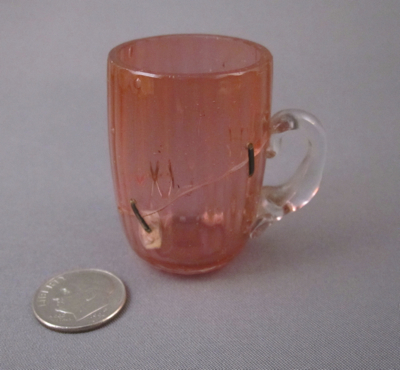 But in my humble opinion, it is not nearly as interesting as mine.